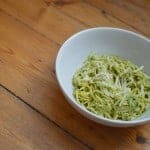 This avocado pesto pasta is born both of my love of pesto and guacamole, and a photo I saw whilst wasting my life on Instagram a week or two ago. It’s a really simple recipe that’s great for making in a hurry or if you really can’t be bothered cooking properly mid week. It serves 2. Start by pealing and de-stoning your avocado, then cut roughly into cubes and dump them in the blender (I used the attachment for a hand blender). Roughly chop the spring onions and add them in too. Top this with the basil, chillies, cheese, salt and pepper before pouring over half the oil. Blitz for about 15-20 seconds, then stop, squeeze in the lime juice and add more oil if it looks too solid, scrape the sides back into the middle and continue to blitz until its more like a paste. Set aside for a couple of minutes. Add your past to a pan of boiling water (it should be lightly salted), and cook according to the instructions or it is al dente. Drain the cooked pasta, saving about 3 tablespoons of the liquid from the pan. Add this pasta water to your pesto-mole/guaca-esto (or whatever you want to call it), then blitz it one last time. Pour into the pasta and work through over a medium heat to ensure it’s all warm. Pour into a bowl and scatter with some more cheese, just because.